The bearded man is Elias "Grandpappy" Moore. Next to him is his daughter (and Detlus Trogdon's wife) Ada Moore Trogdon. The children all belong to Detlus & Ada Trogdon. Standing are Ila & Lora. The boy is Delbert and the girl sitting is Velva. Elias was the son of George Moore and Mary "Polly" Maness. Mary Ann was the daughter of James F. Garner and Mosley Caviness. James Alfred was the son of Edward "Ned" Richardson and Dicy Presnell. Mary Ann was the daughter of William Wood and Catherine Hunsucker. Wife of Bryant Caddell and daughter of Joel Sullivan and Nancy Seawell. This photo was labeled "B Caddell's wife" was found in Viola Cagle McNeill Seagroves' photos after her death in Feb 2013. No one living can identify or give info. Bryant would have been Viola's grandfather Wm. Neill Caddell's half brother, same dad, diff mothers. Ritter family L-R: Lula May, Joel Richard, Mary Ann McKenzie Ritter, Mary Lee (in lap), Archibald Harrison "Bud", William Charles "Charlie," Catherine "Cattie," and Susanna Bryant. (As written on back with formal names added. Not sure who Susanna Bryant was.) From the collection of Flora Jane Ritter. 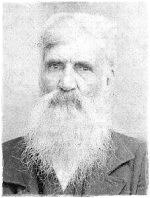 John was the son of Elisha Cagle and Ann Elizabeth Stutts. Margaret was the daughter of Elizabeth Ritter.